There is an unexpected power and poignancy to “Tuesdays With Morrie”. While the play is about death and dying, at the same time it is filled with warmth and humour, daring us to look the spectre in the face and readying us to greet it not just as a natural process when it comes, but as an old friend reaching out to give us one final embrace. Based on two very real people, it explores the relationship between a teacher and student who have surpassed the boundaries of mentorship and friendship, and moved into a deeper, more loving and understanding relationship. These men become family in the most positive sense of the word, offering strength and comfort to each other as they face the trials of this life and move into the beyond. Morrie (played impeccably by Ian D. Clark) is the journalism professor, a caring confidant who nurtures Mitch (his student, played by Geoffrey Pounsett) throughout his time at Brandeis and continues to be there for him whenever his need arises for the rest of his life. Mitch – like so many of us – is reluctant to receive or understand this, but eventually discovers that there is far more to life than his job as a sports reporter and any fame he may be hoping to achieve. Thanks to Morrie and his struggle with ALS (i.e., Lou Gehrig’s Disease), he learns to understand the importance of the “touching and the feeling”, and goes on to complete himself as a person. The performances are strong, compelling and completely believable. We watch the life loving, warm spirited Morrie go from a physically energetic dancer and instructor of many to a feeble, failing shell, still holding a spirit that refuses to let itself be conquered. At the same time we see the coltish Mitch knuckle down, struggle and finally become one with the processes not only of maturity, but of facing his mentor’s mortality and (in some ways) his own. As with everything he does, Ian D. Clark is Morrie, living the character fully and completely. Geoffrey Pounsett plays Mitch, and is an excellent counterbalance to the power of the main character. “Tuesdays With Morrie” runs at the Springer Theatre in Gananoque from August 28 – September 19. Show times are Tuesday through Saturday 8:00 pm, with matinees Wednesday, Saturday and Sunday at 2:30 pm (starting the Sunday after opening night). Deck chats will be Wednesdays at 1:30 pm and Thursdays at 7:00 pm. A special ASL performance takes place September 12. Tickets are $32 for adults, $30 for seniors age 65+, $20 for <30 Club, $16 for students, with a half price preview on June 19 (HST will be added to all prices). Perimeter seating is $27 and group tickets are available at $26 – $28 each. Running time for the show is about 1 hour and 15 minutes with no intermission. This show is recommended for people of all ages. For more information, please go to http://www.1000islandsplayhouse.com or contact the box office at 613-382-7020. 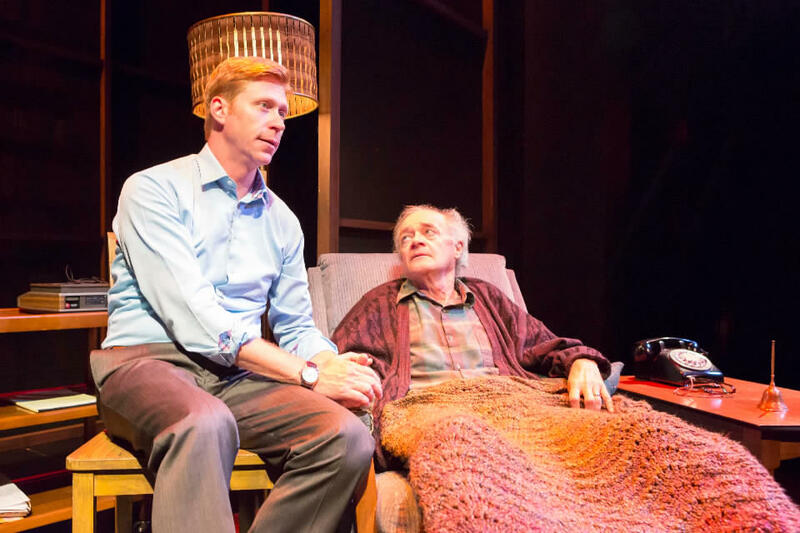 This entry was posted in Arts and Entertainment, Theatre, Thousand Islands Playhouse and tagged Gananoque, Thousand Islands Playhouse, Tuesdays With Morrie by llpayette. Bookmark the permalink.